Look Left Look Right Look Left again. Well that's how we learnt our road rules. We ride our bikes to walk our dog, he likes to run. I don't know if I would try it with two, well not two like the one I've got! Great catch, Mo. Thats a different way to walk the dog! Look left, look right, that's the thing I have the most trouble with when traveling to London. I have to keep telling myself, look both ways, it's safer!! Every time I see a biker with a dog, I find that very dangerous. 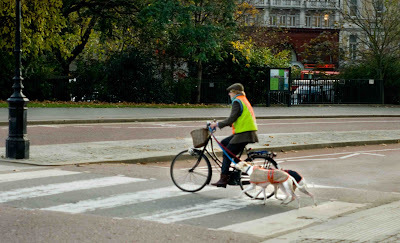 Does the biker help the dog to cross the street or does the dog. Who does look on each side ??? Our dog would never allow us to walk her while riding a bike. She's too demanding of our time and has to constantly be assured we're with her.